You won't hear many sermons preached on Ecclesiastes. The plainspoken skepticism and raw weariness expressed in Ecclesiastes make many people of faith uncomfortable. But, as Waddle points out, this book is in the Bible for a reason. 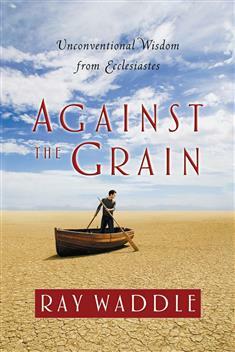 The message of this against-the-grain biblical voice offers an emotionally honest view of the meaning of life. "Despite his reputation, Ecclesiastes marks the surprising arrival of consolation and hope," writes Waddle. "This book is about the neglected themes of Ecclesiastes: the goodness of creation; the fingerprints of providence; the frustrations of spirit in a world of affluence and suffering; the beauty of everyday pleasures; the duty to remember the dead; the duty, indeed, to be happy. It's about feeling the wind in your face, the wind of being alive." This poet teaches, toughens, and spans the ages to address very contemporary issues. By giving us permission to admit troubling spiritual moods, Ecclesiastes invites us to grow in wisdom and to accept all of God's gifts—including doubt and dissatisfaction. Waddle mixes contemporary reflections with insightful scholarship on Ecclesiastes—especially on the topics of biblical authority, politics, grief, wisdom, and spiritual trends in contemporary society. The 12 chapters parallel the 12 chapters of the biblical text. Become better "equipped for every good work" (2 Timothy 3:17) and for the inevitable periods of spiritual doldrums through the renegade-but-faithful realism found in Ecclesiastes.